FINALLY overcome your fear of public speaking!!! For many people the idea of standing before a group of people and speaking is more than just fearful, it is paralyzing. Hypnosis is the answer for those who start to sweat at the mere mention of public speaking. There are many occasions at which people will be required to speak in public. Most people in fact will need to make a speech, presentation or toast at some point in their lives. Overcoming the fear of standing in front of other people can be accomplished through hypnosis. 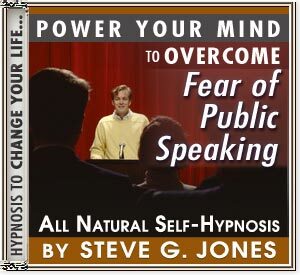 Hypnosis helps to overcome the fear of public speaking by helping you first to relax. The relaxation methods that introduce the hypnotic stage of a self hypnosis program can also be used to prepare and calm your self before the actual speaking event. However, hypnosis goes a couple of steps further. It is able to change the way you think about yourself, your audience, and the event of speaking in public. Relax. This stage takes you to a state of mind similar to that which occurs right before you drift off to sleep. It opens the mind to other messages that aid in overcoming any kind of fear. Organize. Thoughts, especially negative thoughts such as “I can’t do it” are re-grouped so that the thoughts that cripple you before a crowd are pushed away and eventually out of your thought process completely. Suggest. New, more positive thoughts are introduced to equip you with a can-do attitude. The power of suggestion has a great deal to do with how we view our own capabilities and to increase the confidence needed to speak in front of other people.